If it weren't for the palm trees and the public beach accesses, you might not think you are in Hawaii while driving down Kahala Ave. Lined with homes that are double and triple the average Oahu home size, Kahala is known as one of the premier upscale communities on Oahu. While some homes on Kahala Avenue may seem over-the-top for Hawaii, many others offer beautiful Hawaiiana atmospheres, with large open floor plans that incorporate indoor/outdoor living areas. The streets just behind Kahala avenue are just a short distance off the beach, and often feature large lot sizes, quiet neighborhoods, and quick access to Downtown, Waikiki, or out to Hawaii Kai. Kahala Avenue also features a selection of rare, vacant lots, now available on the market for those buyers looking to start from scratch and build their own dream estate. Other highlights of the Kahala area are the upscale Kahala Mall, with theaters, shops, boutiques, and even a Whole Foods. The Kahala Hotel sits at the end of the road, and is one of the landmark hotels on Oahu, a favorite of presidents, celebrities, and dignitaries. 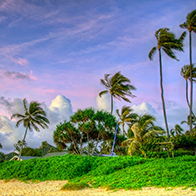 Contact our Kahala Specialist for more information on buying or selling in the Kahala Area.